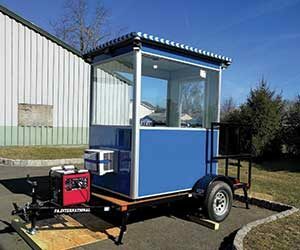 Mounted on a small flatbed trailer , mobile guard booths are designed for large or temporary work sites, companies with multiple properties, and any location that needs supervision or controlled access. Surprisingly affordable, mobile guard shacks provide the same level of security and safety as permanent installations, but have the advantage of being able to move to new locations as needs change. Because they are mobile, portable guard booths can be put in place in a matter of minutes. Installation takes as long as it takes to get it there! Guard shacks mounted on flatbeds can be hooked up to just about any vehicle with minimum towing capabilities and moved into position quickly. Power is plugged in and you’re ready to go. Portable generators are also available for sites that don’t have access to power. A mobile guard booth is the perfect solution for companies with multiple job sites. When you’re finished at one location, simply move it to the next or take it to your warehouse for storage. Different events have different needs. Certain situations may call for controlled access points while others need centralized locations to monitor conditions. Mobile booths can be deployed strategically at no additional cost. When needs change, just pick it up and move. Even at single job sites, your security needs may change as projects evolve. Today’s access point may be closed off depending on the job. For example, the trailer booth could be used for guards to patrol the busiest entrance of a large property in the morning, and then moved in the afternoon to patrol the exit on the other side of the property. At public venues, different events may have different security needs depending on crowd size. 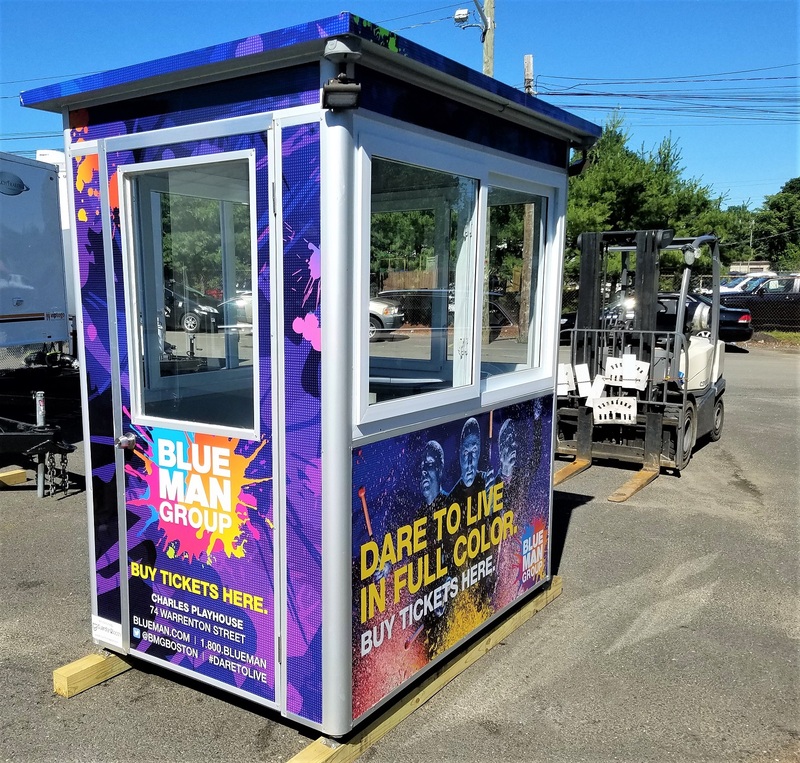 Mobile booths offer flexibility to adapt from large-scale events with managed control points to smaller events with more defined parking needs. Whether it’s controlling access or providing centralized security, changes can be made even during events if necessary. Having a portable application may prevent the need to purchase multiple gatehouses at multiple locations even for temporary needs. You can skip the time, labor, and expense of building another structure or moving a prefabricated enclosure into place and preparing a pad. In addition, when the job is done – or needs change – you won’t have the added cost of tearing down or moving your guard shack. In some applications, guard booths are in high traffic areas and susceptible to damage by equipment or visitors to the site. Portable security enclosures can be easily moved during high-traffic times or when heavy equipment needs to be brought on-site. In severe weather conditions, such as tornadoes, hurricanes, or floods, mobile guard shacks can be moved to protected areas to avoid damage. This can also reduce costs by negating the need to install more heavy-duty materials, such as glass rated for hurricanes, because the structure can be moved away from danger. Mobile security booths provide the same level of security and safety as permanent guard shacks. A full 360-degree view provides guards a secure vantage point. Customized shelters provide safety and help to maintain focus, especially under disruptive weather situations. Tinted windows can mask employee movements while allowing a covert vantage point and work as a deterrent whether occupied or not. Properly positioning security guard booths can help prevent trespassing and theft in any industry. 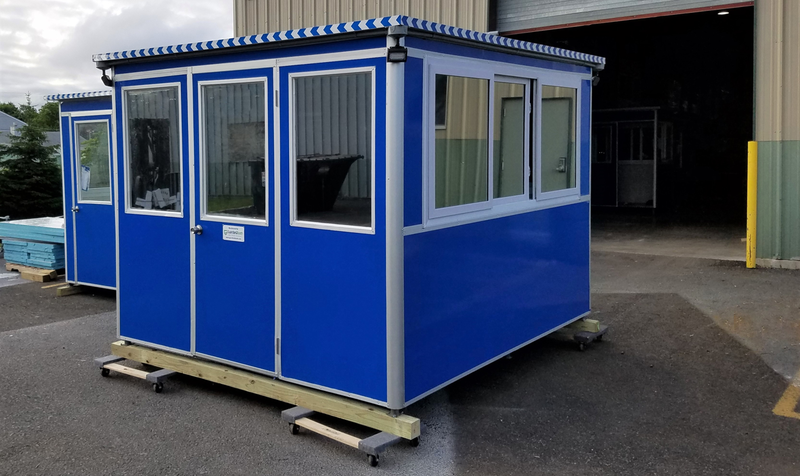 In addition, portable guard booths can be equipped to provide everything you need to operate efficiently and comfortably, including electricity, and heating and/or cooling. Modular seating, work stations, desks, and other options can be installed as well, including data ports and phones. Booths can be customized with a vinyl protective wrap in a variety of colors to add a glossy look that won’t scratch as easily as metal and won’t fade as easily. Booths can also display company logos, hours, pricing, or other information on the exterior. Exterior electrical disconnect switches make it easy to shut off all power to the unit from the outside. Duplex Ethernet ports and phone lines can be pre-installed in conduit to make communication easy and effective. Breaker panel boxes provide a central access point for electrical hookup that can be distributed as needed throughout the enclosure and include a circuit-breaker to prevent power overloading. Baseboard heaters keep the booth warm and include built-in thermostats. This prevents the need for guards to bring in portable heaters which could cause fire hazards. Built-in air conditioning units with remotes give employees control over the temperature on even the hottest days. There’s no need for portable fans to stay cool. Tinted windows allow guard to see what happening 360 degrees without being seen from the outside. In addition to masking movements, it reduces heat inside the booth and blocks potentially harmful UV rays. Outside LED spotlights can light up surrounding areas at night to make the security booth more noticeable and provide a safer work environment for the guard. Work spaces inside the unit can be customized with additional desks and drawers. Other add-on features include fixed glass windows versus sliding windows, sliding or swinging doors, solid walls, them-them doors, transaction slots, numbered key hooks, counters, metal lockers, and more. A mobile guard booth is the perfect solution when you need a portable booth. Portable gatehouses can be customized in many ways for your specific application and provide for flexible use. 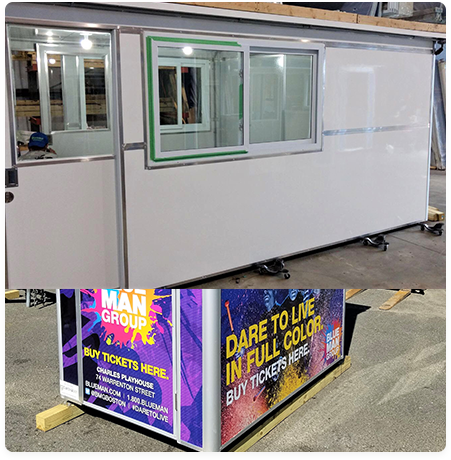 Regardless of size or customized features you need, the R&D experts at Guardian Booth can manufacture a portable booth that provides the options you need at your property, job site, or parking facility. For pricing information or to clarify any questions you have, visit our booth pricing page or contact Guardian Booth directly. Guardian Booth is a manufacturer of prefabricated structures, enclosures, and booths for guards, parking attendants, ticket vendors, and cashiers. In addition, Guardian Booth is a market leader in portable security enclosures and modular office enclosures.